Two days after the massive May 1 actions, Chicago police fired on a protest of workers at a South Side factory, killing four people. 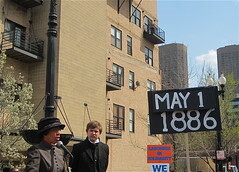 A protest demonstration was called the next day for Haymarket, just west of downtown. The rally was peaceful, but as it was nearing a close, police waded into the crowd. At this point, a bomb was thrown into the ranks of police–and this became the excuse for a deadly rampage by the authorities. Eight working-class radicals were arrested and charged with conspiring to commit the bombing–even though most weren’t even at Haymarket when the explosion occurred. The eight radicals were prosecuted–but it was the entire eight-hour movement that was put on trial. The robber barons wanted to destroy the workers’ movement. And they had good reason. The struggle of workers–and their demand for the eight-hour day–threatened the very foundations of the employers’ profits. THE EIGHT-hour-day movement was born in sweatshops, factories, packinghouses and rail yards across the country–where workers regularly worked more than 14 hours a day. The movement of the 1880s was actually the second attempt to reduce the length of the working day–the first was in the 1860s, after the Civil War. According to Sidney Lens’ The Labor Wars, hundreds of eight-hour leagues formed between 1865 and 1868, 50 in California alone. In cities and states across the U.S., laws were enacted calling for the eight-hour day, but they were typically filled with loopholes that bosses could use to take the teeth out of these measures. Some politicians said they supported the eight-hour-day call, like Gov. Richard Ogslesby in Illinois, but when it came to enforcing eight-hour laws–or doing something when the bosses flouted them–they turned the other way. The eight-hour demand was renewed in the 1880s in the context of a big economic expansion in the U.S. During this era, the number of factory workers doubled, with some 5.25 million immigrants coming to the U.S. to work. Activists felt that with an economic boom, capital should be able to afford to hire more workers and decrease the hours of work each week–and thus the time was ripe to bring back the eight-hour-day demand. As industry developed in the U.S., the nature of work was also fundamentally transformed. So for instance, McCormick, which made reapers or harvesters, was able because of better machinery to use few workers to do the same work. Into this world, with its honored traditions, its irregular work and its habits of mutuality came the machine. It rattled on relentlessly “never tiring, never resting,” wrote [Haymarket defendant] Michael Schwab, dragging the worker along with it. And behind the machine stood a man, an owner or a foreman who regarded the craftsmen’s stubborn old habits and craft union rules as nothing more than ancient customs, relics of medieval times in a modern world governed by the need for industrial efficiency and the unforgiving laws of political economy. The growth of the eight-hour movement was also fueled by other upheavals that came before it, like the Paris Commune in 1871, when French workers and the poor established a workers’ government for a short period. While the Commune lasted only about two months, and took place thousands of miles from Chicago, it had a lasting impact on what working-class militants internationally thought was possible. That light is still with us; it illuminates a path for all the oppressed people throughout the world…But it is not simply with us; that light of freedom has become a lambent sea of fire, whose molten wages will soon consume the citadel of order…If they could see beyond their graves today and hear the millions who join the call “Long live the Commune!” they would say: large was the sacrifice, larger yet what has been won. In 1877 came a huge wave a strikes by railway workers that began in West Virginia and spread across the country. Workers sometimes waged pitched battles with company goons and police, as the rail bosses tried to smash the strike at all costs. In Pittsburgh, for example, the National Guard was called in to attack workers, and 20 people were killed. In Chicago, workers held their own against federal troops in the nightlong “Battle of the Viaduct,” in which 30 workers were killed. Because of this, the militants of the eight-hour movement were as familiar with the brutality of the bosses’ guards and the government’s troops as they were with the tyranny of the bosses on the shop floor. MANY OF the immigrants who came to the U.S. also brought with them radical politics. The German émigrés were familiar with socialist, anarchist and other radical ideas, which were eagerly discussed in German-language newspapers and the gymnasiums known as Turner Halls that were part of a rich left-wing political culture. August Spies, for instance, moved to the U.S. from Germany with his family as a teenager. While he knew little about socialism when he arrived, he quickly drank up socialist literature and attended political meetings, eventually becoming a tireless organizer and public speaker. He joined an armed organization of German workingmen called Lehr und Wehr Verein (Instruct and Defend Association) after a meeting of workers was attacked in 1877. Spies became editor–along with another Haymarket defendant, Oscar Neebe–of the German-language newspaper Arbeiter-Zeitung, one of the most widely circulated radical newspapers in the U.S. But there were also many native-born workers who helped build the struggle, and came to understand the importance of solidarity among all workers. Albert Parsons is a great example of a worker transformed by the radically changing times. After the Civil War–in which he fought on the side of the Confederacy!–Parsons became convinced of the importance of advocating the rights of Blacks. He supported Reconstruction and began publishing a newspaper in Waco, Texas called the Spectator that supported equal rights for freed slaves. This, along with his marriage to a former slave, Lucy, made him the target of racists. Albert and Lucy–who has her own long and courageous story of radicalism–moved to Chicago, where he found revolutionary politics after taking a turn at electoral politics. Devoting himself to the anarchist cause, he started his own newspaper The Alarm. Radical workers like Parsons and Spies were the backbone of the eight-hour struggle. In Chicago, the two men were key to building the International Working People’s Association (IWPA), which organized activities that challenged the bosses and captured the angry mood of workers. Thanks to the arguments made by revolutionary syndicalists like Spies and Parson, the anarchist IWPA was convinced to organize within the labor movement, and in this way, the group built a base of support among Chicago workers. The eight-hour day demand fit well with that organizing. The Knights of Labor–a group that had grown from nine members in 1869 to 700,000 in 1886–supported the demand for the eight-hour day. But its leadership opposed striking to win this or any demand. This was inconsistent with the beliefs of most Knights members, many of whom actually joined the group out of a rail strike in 1885. So despite the fact that Knights of Labor leader Terrence Powderly told members not to take part in strikes for the eight-hour day, but to write short essays instead, local Knights assemblies joined in the movement, and organized many of the walkouts. The Federation of Organized Trades and Labor Unions–which would later become the American Federation of Labor (AFL), but was at this time substantially smaller than the Knights of Labor–endorsed the eight-hour-day movement in the hopes that it would save its floundering organization. The federation called for a general strike on May 1. EXPECTATIONS WERE high among workers about the May 1 general strike. On that day, 190,000 workers struck around the country. Some 150,000 more won the demand beforehand by just saying that they would strike, or by organizing their coworkers to clock in at 8 a.m. and leave at 5 p.m. In Chicago, by May 1, 45,000 workers–35,000 of them in the packinghouses–had already been granted a shorter workday. And on the day of the strike, some 65,000 to 80,000 workers joined the picket lines. The employers decided that the workers’ movement had to be stopped at all costs, and they decided to make radical leaders in Chicago an example to workers around the country. On May 3, some 6,000 lumber workers who were on strike for the eight-hour day turned out for a meeting near the McCormick Reaper Works on the South Side. Some 1,400 McCormick workers had been locked out since February and replaced by 300 scabs. When workers from the meeting joined their brothers to confront the scabs at McCormick, some 200 police descended on them. Four workers were killed and many others injured when the cops attacked. The bosses’ counter-offensive would continue for days, as the Chicago police attacked gatherings of workers all around the city. Organizers called an outdoor meeting in Haymarket Square–near the city’s meatpacking district–to protest the police attacks. The 3,000-person event was smaller than organizers expected. Mayor Carter Harrison even went to the rally to see if there was reason to expect there would be any violence, and seeing that there wasn’t, he told the police as much. With rain setting in, the crowd had thinned out to about a third of its original size. Samuel Fielden was speaking when the police began to attack the crowd on the order of Chief Inspector John Bonfield. At this point, a bomb was thrown–by whom is still unknown. One police officer was killed on the spot, and seven more died of their wounds later. The number of workers killed by the explosion and by the police rampage in the aftermath was less carefully reported upon, though the number of wounded were counted in the hundreds. Portraying the eight who were eventually charged–Parsons, Spies, Schwab, Fielden, Neebe, Adolph Fischer, George Engel and Louis Lingg–as dangerous criminal instigators, prosecutors put cause of the entire labor movement on trial. All the defendants were convicted–death sentences were handed down on all, except Neebe, who was given 15 years in prison. In response, protests against the verdict were organized around the U.S., led by Lucy Parsons, while socialists and radicals in Europe like Eleanor Marx, William Morris, Oscar Wilde and Frederick Engels spoke out there. Illinois Gov. John Altgeld commuted Fielden’s and Schwab’s sentences to life in prison, and Lingg committed suicide, exploding a stick of dynamite inside his mouth the day before he was supposed to hang. Parsons, Spies, Fischer and Engel were hung on November 11, 1887. Two days later, some half a million workers lined Chicago’s Milwaukee Avenue as the funeral procession for the Haymarket Martyrs marched to the railway station for the trip to Waldheim Cemetery. By and large, the campaign against the Haymarket leaders had its intended effect, shutting down the struggle for the eight-hour day, sending a chill through the labor movement and hindering the growth of radical struggles for years to come. The idea of a militant, fighting labor movement envisioned by the Haymarket Martyrs was largely replaced by a “more practical” unionism made up of the remnants of the Federation of Organized Trades, soon to be led by Samuel Gompers. But for future generations of labor militants, socialists and other radicals, the eight-hour struggle and the words of the Haymarket Eight provide a message of defiance in the face of repression–and of the power of a working class united in struggle. [I]f you think that by hanging us, you can stamp out the labor movement–the movement from which the downtrodden millions, the millions who toil and live in want and misery–the wage slaves–expect salvation–if this is your opinion, then hang us! Here you will tread upon a spark, but there, and there, and behind you and in front of you, and everywhere, flames will blaze up. It is a subterranean fire. You cannot put it out. The ground is on fire upon which you stand. This entry was posted in All Posts News Politics and-or Videos, History, Labor, Police Brutality, Politics, Protests, Socialism and tagged Activism - Protests - Boycotts, Elizabeth Schulte, Haymarket Riot, May Day, Schulte-Elizabeth. Bookmark the permalink. The model has to change again. The social dynamics have to change, & the relationship ethos of provisioning and the global skills-base must evolve. The way we conceptualize life and society has to change. Our ideas of distribution and acceptable purpose must change. The whole notion of a “labor market” is fundamentally immoral, because it quantifies human beings as commodities in an economic equation that is entirely artificial and destructive ~ of ecosystems, cultures and lives. That out-of-date bankrupt thinking is nothing less than the perpetuation of institutionalized wage slavery for no justifiable purpose. It may be rational, but then a psychopath may be rational. We’re all workers in one sense or another, at some functional level of engagement; the only difference is in kind. Our degree of self-determination is shaped either by geographical circumstance or the chance of birth, that may confer the privilege of choice and the golden opportunity to exercise free will, or deny us the capacity to exercise our true potential. We are all different; some are less, some more able to develop and evolve. Institutional slavery destroys natural identity. One could envisage a just society where individuals submit voluntarily to enlightened direction, but a better system would empower its citizens through right action, holistic education and just leadership. My view is that the disproportionate nature of special advantage must be arrested and adjusted, by consciously and deliberately adopting an ethical standard that confers an acceptable and effective ratio of wealth to performance, that is both fair, sustainable and just. This can only really occur on a micro-level, in manageable worker operated businesses, where stakeholders have cooperative rights, and the ownership responsibility is accountable and transparent because it is distributed according to real ability, earned experience and authentic investment in time, means, commitment and knowledge. The “bottom line” then ceases to be a struggle for the accumulation of militant power through ruthless profiteering, but proactively mutates into intelligent standards of environmental responsibility, community ethics, ecosystem services facilitation and social equity. There are and have always been examples all over the world of this type of social activity. The main problem today is the sick weaponizing politics of fat-brained corporate metastasized industrial anarchy, that is destroying the very fabric and context of our lives, and preventing us from living like true human beings ~ free to enjoy a wholesome, honest, creative and ethical existence in a productive environment in which we are the stewards and ecological gatekeepers, not ideologically cloned parasites and mindless predators.